Interesting set of signs. 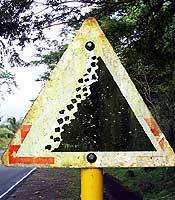 Falling rock signs in the Philippines fall apart in two kinds. A design with only a few rocks and another group with many more. 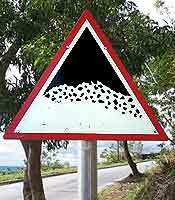 The first design is peculiar because only a minority of rock warnings feature a grounded rock. In this case the shape suggests that it is probably a heap of pebbles, but still. Find other examples in France, Spain. 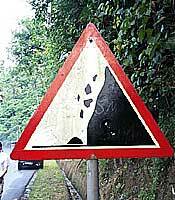 With the other signs the Philippines gain the top position in the list of countries with many boulders on their warning signs. Other countries like Ecuador (Read the rock statistics) do their best but none can beat the 45 boulders of this sample.